And Jesus went into the temple of God, and cast out all them that sold and bought… and overthrew the tables of the money changers and the chairs of them that sold (Mt. 21.10-17). St. John “the Beloved” also saw the Lord making first “a scourge of little cords” (2.15) for casting out those servants of filthy lucre. “They shall take away the Continual Sacrifice [our Ancient Rite of Worship in Latin ] and they shall place there the abomination [a “New disOrder of ‘Mass’ – the Lutheran/Episcopalian ‘banquet’ by ‘presiders’ in ‘communion service’ costumes] unto desolation” (Dan. 11.31). What terrible chastisement will these usurpers at the Holy Place – Protestant “presiders,” representing the Neo-Christ: the ‘humanist’ “all mercy and compassion”-Christ of the “Novus Ordo” One-World-Religion, at “banquet” tables (supplanting the DESTROYED ancient high altar reserved to the true God – our “Catholic God,” the God of BOTH “Merciful Love” AND strict Justice Which knows wrath consuming the wicked and the sinner with fire: Is. 1.28) serving the “abomination of desolation” (Mt. 24.15) in place of the “Continual Sacrifice [our Catholic Resistance – Tridentine Latin Mass]… taken away” (Dan. 12.11) – meet with? 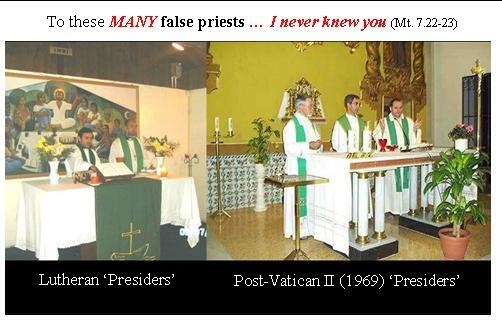 2) our churches which witnessed the violation of our true God’s own altar (which does not admit of being shared with the service, the sacrilegious Neo-Catholic ‘M[e]ss’, of the Neo-Catholic [g]od – no other than the devil under the guise of Vatican II-‘humanist’ Christ of all merciful understanding)… Pope Benedict XVI himself knew very well writing to the effect that: the time will come when the Church… can not enjoy anymore the restoration of that Continual Sacrifice in her glorious beautiful churches She enjoyed in her liberty and prosperity! This entry was posted in Christian Life, Sacred Scriptures, Traditional Roman Catholic Order, Vatican II mock-Catholic Religion and tagged abomination of desolation, Christianity, Neo-Catholicism, New Catholic Theology, New Mass, Pope Benedict XVI, Traditional Latin Mass, Vatican II. Bookmark the permalink.